One of the more common childhood food allergies concerns the humble soya bean. It can be hard to eliminate because it seems to hide in almost everything our children want to eat. So what are the symptoms and should you be saying so long to soya? It’s the protein in soya that causes any allergic reaction. It’s an immune system response caused by your child’s body mistakenly believing the soya protein to be harmful. The immune system releases histamine in order to protect the body, but it’s this that triggers the potentially long list of symptoms – from the tedious to the terrifying. In the west, soya allergies are much less common than they are in eastern countries such as Japan, where soya is part of many traditional foods such as soya sauce, tofu and miso. But soya is one of the more common childhood allergies and it particularly affects babies and younger children. As unfair as it may seem, it often strikes the same children who also have a cow’s milk allergy. One way of trying to prevent your child becoming allergic to soya is to breastfeed until your little one is at least six months old and avoid giving them soya or cow’s milk until their immune system has had time to establish itself. As with many other childhood allergies, the symptoms can range from mildly irritating to life-threatening anaphylaxis. When the immune system sets off a reaction, symptoms can affect many important areas of the body, including the respiratory system, the stomach and the skin. The results might be a runny nose, an asthma attack, sore eyes, diarrhoea, fever, vomiting, itchy skin or wheezing. If your child shows signs of shortness of breath or difficulty breathing, do not wait, call for emergency assistance. This could be an anaphylactic reaction, which can quickly cause unconsciousness and even death. Which Foods Should my Child Avoid? Avoiding soya can be a real headache. It’s in many, if not most, processed foods, including breakfast cereals, burgers, bread, biscuits, ready-meals, soup and many of the kind of ‘freezer-to-grill’ convenience foods that kids love. Be particularly careful when you’re eating out. Ask the restaurant manager which foods he can guarantee are free of soya. You might be disappointed with the result. Don’t forget, it’s that annoying protein in soya that causes the immune system reaction, and there are about fifteen different proteins in soyabeans. Some people are allergic to one, some to another, so it can be particularly tricky figuring out exactly what might cause a reaction. Your child might be fine with one kind of soya food, and then react badly to another. Apart from getting tested by a doctor, you can help track down the culprits by keeping a food diary for your child, and taking careful note of any reactions. If that’s not enough, you might need to watch out for other foods too. Some children allergic to soya are also allergic to other foods from the same family, such as peanuts, lentils, peas, chickpeas, rye, barley and wheat. Ask your doctor about separate allergy testing for each food. Apart from reading labels and asking plenty of questions whenever you and your child are eating out – you could try switching to rice milk instead of soya or cow’s milk. And you might be lucky enough to find that soya bean oil and soya margarine don’t cause a reaction. This is because most of the protein has been removed during processing. 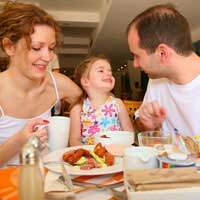 Managing your child’s soya allergy might seem like a daunting task. But there is reason for optimism. Children often outgrow soya allergies, so you could try re-introducing soya to your child’s diet once they’re a bit older and their immune system has ‘toughened up’, but be sure to talk to your doctor about this first. Of course, if your child has ever experienced a life-threatening allergic reaction to soya, then never, ever try re-introducing it. It’s not worth the risk for the sake of a fast-food burger or some instant dessert. Managing a soya allergy can be difficult, but there is one way of keeping the soya bean at bay. More often than not, it’s processed foods that contain soya, so cooking from scratch using plenty of fruit and veg is a great place to start. You’ll find it easier to avoid allergic reactions, and the family’s health will probably get a big boost too.